Do you love to travel? There is no better way to experience a destination and it’s history than by submerging yourself in the country’s culture. Do you love history? We’ve rounded up six of the world’s most historic, and luxurious hotels, that will allow you to see the world through the lens of a different era. Spend some time living in the home of a king. With parts of the castle dating back to the 16th Century, this estate built entirely out of dark blue limestone stands tall today, welcoming guests of all ages. Upon arrival at the castle, take a moment to soak up the majesty of the former home of royalty and gaze at the lake it sits on. Inside, dine under extravagant crystal chandeliers and wake up to extraordinary views of the grounds. The grounds of Rambagh Palace have always been home to royalty, and have become more elaborate and luxurious with every addition they have received. The royal family of Jaipur lived in the palace until as recently as 1957. When you get there, the palace’s butlers will guide you inside and treat you as if you were royal guests. Dine privately in the palace, and finish your day off with a historic walk. Experience centuries of Indian Royalty through the heritage walk, and get a look into the past. Truly, this hotel will have you feeling like it’s old royal inhabitants! In the midst of an ancient city, a building that was once a prison, has been turned into a luxury hotel. 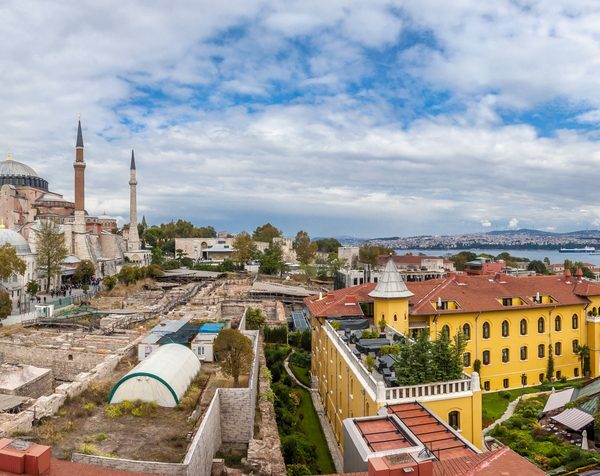 Just steps away from Sultanahmet’s most important monuments, make yourself at home in a neoclassical Turkish prison. The Four Seasons is home to multiple luxurious suites and rooms. Spend the afternoon soaking up the sun in the former exercise yard, which has been transformed into a beautifully landscaped garden. End the evening on the rooftop patio with stunning views of the city. Feel safe within the walls of the De L’Europe. In 1482, the site where the hotel currently stands was used to build a wall to protect the city from an impending war. One of the defense towers from the wall turned into an inn, and over centuries developed into what is now the De L’Europe. In more recent years the hotel has been updated and transformed into a five-star, luxury hotel. We’ve all heard the infamous Barry Manilow song about the Copacabana, and the exotic lifestyle that the song alludes to. In 1923, the hotel was built in preparation for the visiting king of Belgium. Since the hotel’s doors opened, royalty has continued to visit, including the late Princess Diana. The hotel has welcomed many other famous people, including Walt Disney, Elton John, Elizabeth Taylor and Michael Jackson. Copacabana Palace is the first luxury hotel built in South America, and remains a popular destination for many celebrities today. Spend your time feeling on top of the world, with breathtaking views and high class service. Cities all around the world are radiating with culture and history, and a historic hotel is just the beginning of your adventures. Exploring and getting to know the history of your destination is sure to make your trip one you will never forget. Let Fly With Class get you to your destination, in class!